First carbon neutral house in Singapore! This cleverly designed house generates more electricity than it consumes, costs a similar amount as comparable properties in the area…and looks great! 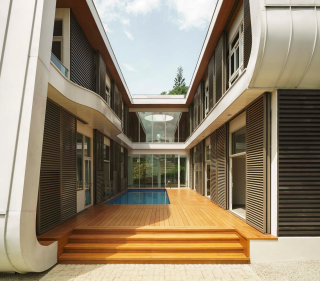 Designed to point to traditional Singaporean architecture, the house features round sweeping edges and a compact layout, incorporating a swimming pool and large balcony – and is the first of its kind in Singapore! Clever planning has gone into the houses layout and design to facilitate and regulate airflow, temperature, rainfall and light, with special consideration to Singapore’s’ hot and humid climate. Take a look at this article for more info and pictures.